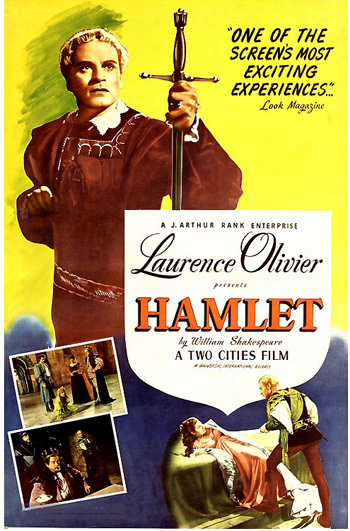 Hamlet was both the first British production and the first non-American or non-Hollywood (foreign-made) film to be presented with the industry's top honor - Best Picture. It is the only film adapted from one of William Shakespeare's plays to win Best Picture. Hamlet's greatest competition was not from The Red Shoes, but from director John Huston's The Treasure of the Sierra Madre (with four nominations and three wins - Best Supporting Actor, Best Director, and Best Screenplay) about three prospectors and their obsessive search for gold. ** Johnny Belinda was one of the dozen or so films in Academy history that received nominations in all four acting categories (Best Actor and Actress, and Best Supporting Actor and Actress). Another contender for awards this year was the Swiss-made film by director Fred Zinnemann, The Search (with four nominations and one win - Best Motion Picture Story, and a Special Award for Ivan Jandl - "outstanding juvenile performance of 1948"), the first film to be made in Europe after WWII with an American director and cast. Forty-one year-old Laurence Olivier also won the Best Actor race for his title role as the melancholy Dane in Hamlet, becoming the first (and the only) person to win as actor and as producer. In other words, he was the first actor to direct his own Oscar-winning performance - in a unique position, he was Best Director-nominated for his own Oscar-winning Best Actor role. Italian actor Roberto Benigni repeated this feat for Life is Beautiful (1998, It.) fifty years later. Britisher Laurence Olivier was the first non-American director to win Best Picture. Although he had been nominated three times previously for superb performances in Wuthering Heights (1939), Rebecca (1940), and Henry V (1946), this was his first earned Best Actor award. Playing a silent role as a convincing deaf mute Maine farm girl named Belinda McDonald facing small-town prejudice in Johnny Belinda, Jane Wyman won the Best Actress award for probably her greatest performance ever. 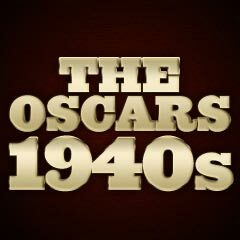 [She became the first actress since silent films to receive an Oscar for a non-speaking role.] When as a single mother, she is raped and bears an illegitimate child that she fights to keep, she is befriended by the town's new doctor (Lew Ayres). The film was released a few years following her two other major career performances - in the Best Picture winner The Lost Weekend (1945), and her first nominated role in The Yearling (1946). Some interpreted her win as a sympathy vote - tragic circumstances in her life corresponded to her work in Johnny Belinda - a baby that she had been expecting was born prematurely and died just before filming commenced, and soon after the film was finished, she divorced her husband - future President Ronald Reagan. The remaining two nominees were Agnes Moorehead (with her third of four unsuccessful career nominations) as Aunt Aggie McDonald in Johnny Belinda, and nineteen year-old Jean Simmons (with her first of two unsuccessful career nominations) as the driven-mad Ophelia in Olivier's Hamlet. This year introduced Best Costume Design awards for color and B/W feature films - a new category of awards. Multiple-winner Edith Head began her impressive run of nineteen straight years of nominations in this category with her first nomination for The Emperor Waltz, but surprisingly lost to Joan of Arc (Dorothy Jeakins and Madame Karinska). She went on to accumulate thirty-four nominations, and eight wins during her career. In the Best Actress category, there could have been a re-match between sisters Fontaine and de Havilland (similar to the 1941 contest) if Joan Fontaine's touching and sensitive portrayal as romantically-obsessed 'unknown woman' Lisa Berndle had been nominated in Ophuls' film. And Ann Miller was neglected in the list of nominees for Best Supporting Actress for her role as Astaire's tap-dancing partner Nadine Gale in MGM's Easter Parade. Also, the previous year's Best Actress winner Loretta Young was un-nominated for her fine performance as a college professor accused of murdering one of her students (in self-defense) in the melodramatic film noir The Accused. Given many weak performances in the Best Actor nominations, it was shocking that Humphrey Bogart wasn't nominated in one of his finest career performances as Fred C. Dobbs, an obsessed gold-hunter in The Treasure of the Sierra Madre. Overshadowed by another Huston/Bogart effort, Key Largo received only one nomination (but it was a win for Claire Trevor). Many other superb performances were neglected among the acting nominations: John Wayne as single-minded cattle-driver Tom Dunson or Montgomery Clift as his adopted, estranged son in the undervalued western classic Red River, or Henry Fonda as cavalry commander in Fort Apache, or John Garfield as cynical lawyer Joe Morse in the dark film Force of Evil, or James Stewart as crusading newspaper reporter McNeal in Call Northside 777, or Anton Walbrook as impresario Boris Lermontov in Powell's and Pressburger's ballet classic The Red Shoes, or Edward G. Robinson as cigar-chomping gangster Johnny Rocco in John Huston's atmospheric drama Key Largo. (Unfortunately, Robinson was never nominated for an Oscar, but he was given an Honorary Award in 1972).